Fixing kamae and unspoken words. On Monday night, I think I fixed a very important element of my chudan kamae. Not that I do anything else except maybe a bit of gedan after sensei did it to me but I realised something about my right kote position. Yet again, this is something that has probably been told to me over and over again but I never made the connection until now. 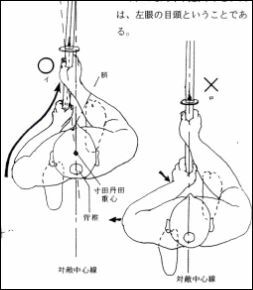 You are told to make sure that your left hand holds the shinai with that very bent wrist position, the hand straight down the kensen, so that when you strike, the arm is straight with the shinai. All good, got that, but what about the right? That’s the one that gets attacked all the time, or at least in my case it did. I realised that my right hand has been drifting round quite significantly and exposing my kote to attack. Sensei attacks it all the time, obviously highlighting it with me. He’s never told me not to do it, but by always attacking the exposed kote, he’s been telling me another way. Once I moved my hand around, my kote was attacked less. This took me think back to when we were visited by Sensei Bell who fights nito. 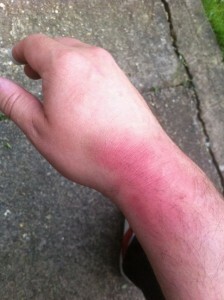 I came back with my right wrist about twice the size it was when I left. Because kote was completely exposed. So despite that fact we are always being told not to use the right hand to move the shinai, it still needs to be adequately thought about in terms of position and movement. This also made me realise that it’s not just about the words you tell someone when you teach them things, it’s also about the physical feedback and methods you employ that communicate just as much. Kendo is physical, communicate physically and well as verbally.